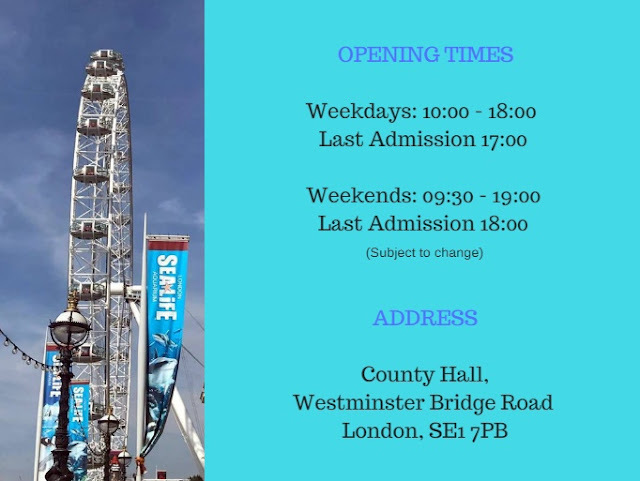 Located on the river Thames, within the County Hall building, SEA LIFE London Aquarium managed by Merlin Entertainments, can be seen just next to one of London's extremely popular attractions known as the Coca-Cola London Eye. It's just over Westminster Bridge from Big Ben and The Houses of Parliament. So basically, it's a red hot location and a tourist trap in other words. 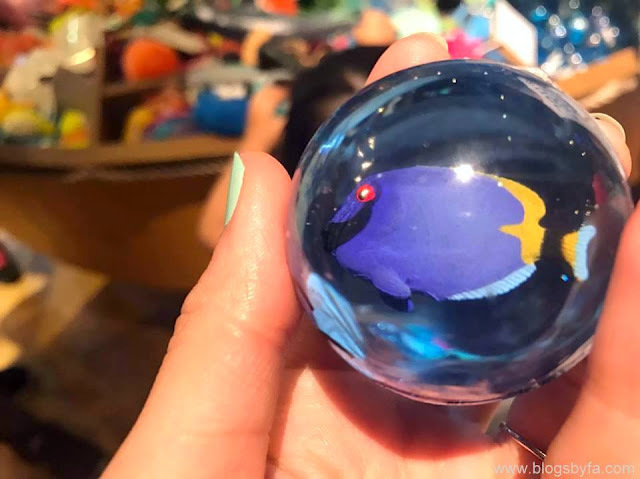 However, it won't be wrong if I'll say that the Sea Life London Aquarium is adored by both locals and tourists, and although the attraction does attract the little ones more, it's actually great for people of all ages to enjoy! I'll tell you how, in the post ahead. Just keep reading! Since the Sea Life London Aquarium has an extremely prime location, they advise visitors to use the public transport. However, you may travel by car as well but I'll have to warn you a bit about the parking issue in the area. You can park the car a bit far and then cross river through 'The Golden Jubilee Bridge' opened on 2nd July 2003 by HRH Princess Alexandra. 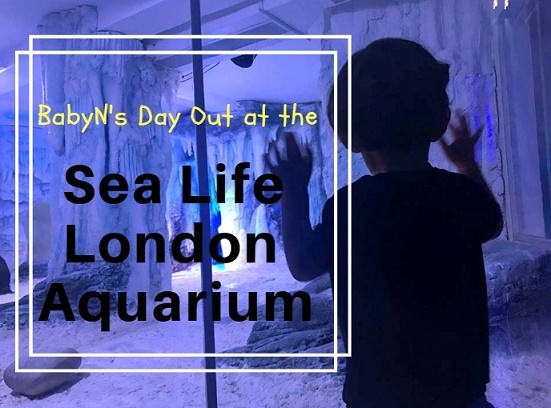 We visited Sea Life London Aquarium on a bank holiday, which I always believe is a perfect day to travel to the 'City of London' by car as the congestion is minimal thus no congestion charge and even free parking is available with ease. We parked the car a little ahead of the Corinthia Hotel, just next to the Citadines Apart Hotel and opted for a 15 minutes walk to the aquarium. Since there are stairs to get to the bridge, the council has placed lifts on both sides. Luckily, the first one was working but the second one to get down from the bridge was out of order, so we had to take BabyN's stroller by the stairs. I'm not too sure about any other option to get to the aquarium because even if you're traveling to the attraction through London Underground, you'll need to get off at the Westminster station and then cross the bridge. 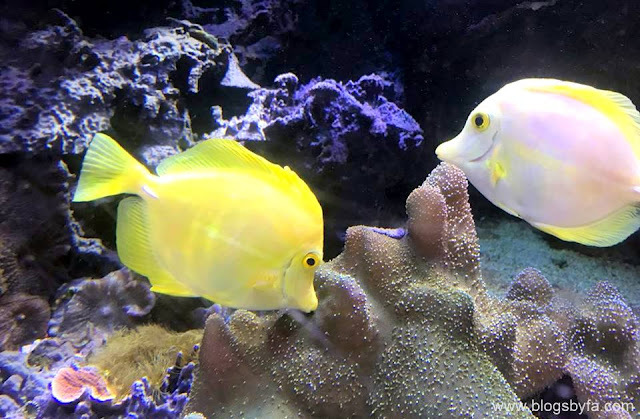 Sea Life London Aquarium welcomes more than 1,000,000 visitors annually and have a tank volume of more than 2,000,000 liters of water where around 600 marine and sea water species live. 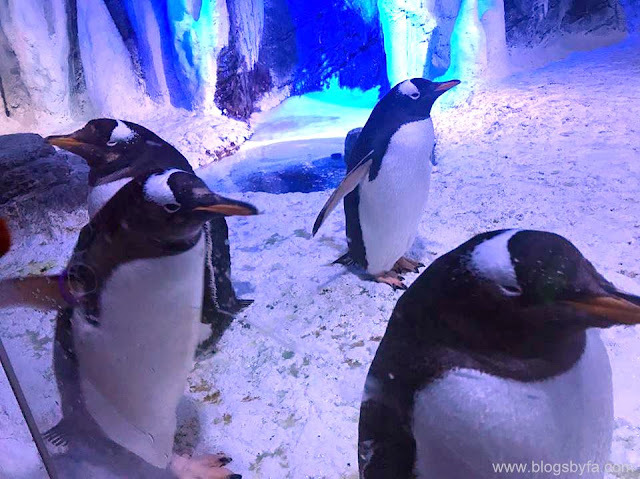 Besides the various exhibits, they have an underwater tunnel, Shark Walk, a Pacific Ocean tank, and a penguin exhibit called Penguin Point with 10 Gentoo penguins transferred from the Edinburgh Zoo. As soon as one enters the premises, we need to queue to get the tickets and although the prices of tickets vary according to the season, the children under 3 go free. After collecting the tickets, the visitors have to get to the aquarium through the Shark Walk. Initially, I was a bit hesitant of walking past through it but was able to gain courage as there was no other option but it was an exciting experience for me. On entering the aquarium, I got to see numerous exhibits and the aquarium has actually been designed in a way that it's divided in various sections on different floors. I also got the chance to touch the starfish which was an amazing experience and there's another exhibit that allows visitors to feel the sting of the jellyfish. I have already experienced that at a beach before so I didn't try it again this time. It actually feels itchy in the beginning but gets better after some time. They've also placed 2 'Hurricane Simulators' where visitors can go and feel the pressure of the wind. This experience is however, not included in the ticket price but one pound coin needs to be inserted in the machine. 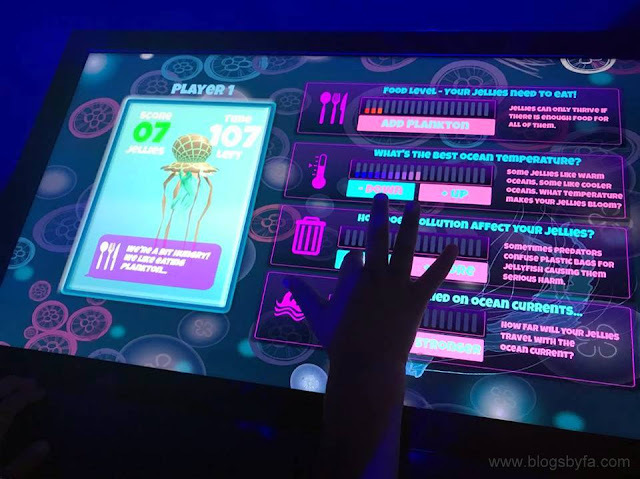 The sea life knowledge that the children and the adults can get by visiting the Sea Life London Aquarium is immense, especially because the exhibits are really interactive. Besides that, as one enters the Thames Tideway Tunnel, you get to see an amazing display of lights and sea life creates popping out on screens. Moreover, they also have a massive screen for playing games, which husband and BabyN' enjoyed! 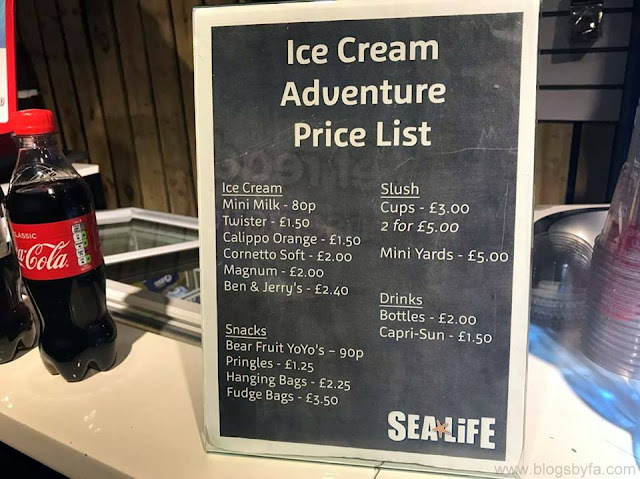 The aquarium doesn't really have a proper sitting area or a cafe but they offer some snacks which you can see below along with the price list. Sea Life London Aquarium also includes classrooms themed around the conservation campaigns in which up to 40,000 school children are hosted to educate them about the different breeding programs. Talking about the VIP Experiences, Sea Life London Aquarium has to offer includes 'behind the scenes tour experience' which is actually closed to the general public but if purchased, you can can learn about extensive breeding, research and conservation programmes run by Sea Life London Aquarium and see how the fish food is prepared! Another experience includes 'Shark Feeding Experience' in which you can feed the sharks in the aquarium's Pacific tank which is home 6 different species of Shark including Sand Tigers, Brown, Black Reef Tip and Nurse Sharks. Another way of getting closer to these sharks is by opting for the shark snorkeling experience. 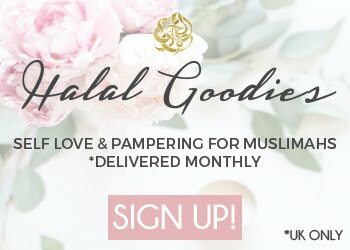 Moreover, I was also fascinated to learn about the wedding proposal experience which enables you to propose to your loved one in a marine setting along with some Pommery Brut Royal Champagne. My family and I spent about 2 hours at the aquarium and in the end, we headed towards the exit but had to pass through the Sea Life London Aquarium gift shop which had an amazing array and variety of sea life creatures and species in the form of toys, jewelry, sweets and items such as bottles and mugs - which are actually perfect for kids to buy and keep as a memory of the trip to the aquarium. Moreover, the visitors also get the option to purchase the photo that had been taken at the entrance and also have the option of getting 3D photos snapped. 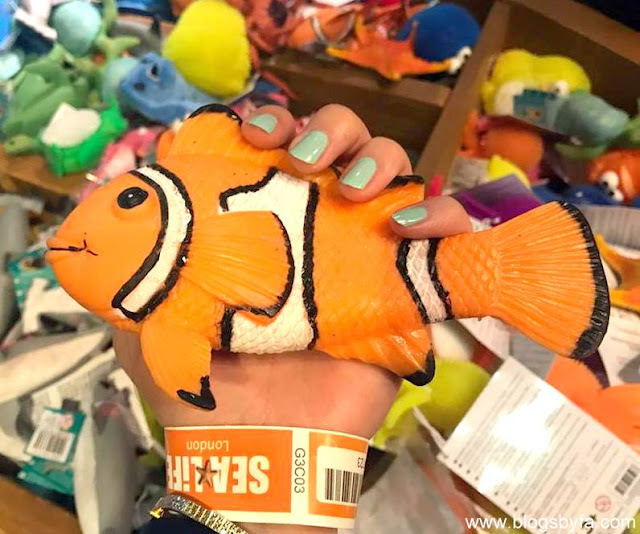 Besides the Sea Life London Aquarium, there are many other attractions managed by Merlin Entertainments such as Coca-Cola London Eye, Shrek's Adventure, Madame Tussauds London & The London Dungeon - and the more you see, the more you will be able to save! You guys can also watch my VLOG of our visit to the Sea Life London Aquarium on my YouTube channel, here. Disclaimer: I was invited to the Sea Life London Aquarium, but as always all the opinions are my own! Sea Life London sounds awesome! I was really surprised to learn that it has penguins! I love seeing the penguins 🐧 they're such an amazing sea life creatures! The aquarium sounds very fun...lots to see and do. What was your favorite fish? My daughter & I went to this aquarium earlier on in the year and it was so incredibly busy that it was difficult to see anything in the tanks. Thank you! I've also added a VLOG on my YouTube channel. Have a look if you fancy it! I love aquariums and every time I go to London I pass by Sea Life. Maybe next time I should actually check it out! I really need to broaden my blogging niche to include going to the Aquarium. 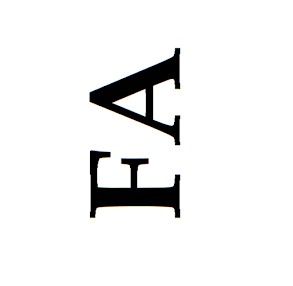 When it went it cost an arm and a leg. It is lovely there though. My kids love visiting the London Aquarium, and it's such a great location too. Awww penguins! I remember visiting here as a child, and it was so amazing! Bet it was a tad expensive though? Ahh so much fun! I love that they have penguins! We are obsessed with penguins but they don't have them at our sea life centres! I love that they have penguins, they're so cute!! I always love the underwater tunnels at aquariums :) The Shark Walk sounds cool, too! This looks like such a fun adventure. My kids love the aquarium in NYC, but the one you went to looks even better! Thanks so much for sharing - adding this to my bucket list. I love the Aquarium, so beautiful and it's amazing for children for them to learn and see all the different sea creatures.